If I were to go on a space mission and I had to eat the last meal on Earth before a diet of colorful pills, I would choose a lavish aubergine parmigiana, even if I were already dressed in a white bulky spacesuit and I had one foot on the shuttle. 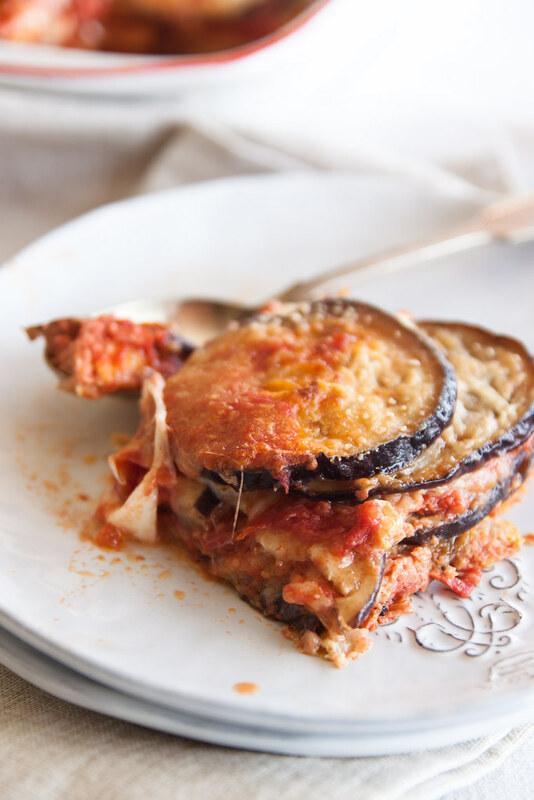 If I have an afternoon craving, one of those sudden pangs of hunger that make you feel like chocolate, chips or doughnut filled with cream, nine times out of ten I’d rather have a warm dish of aubergine parmigiana. 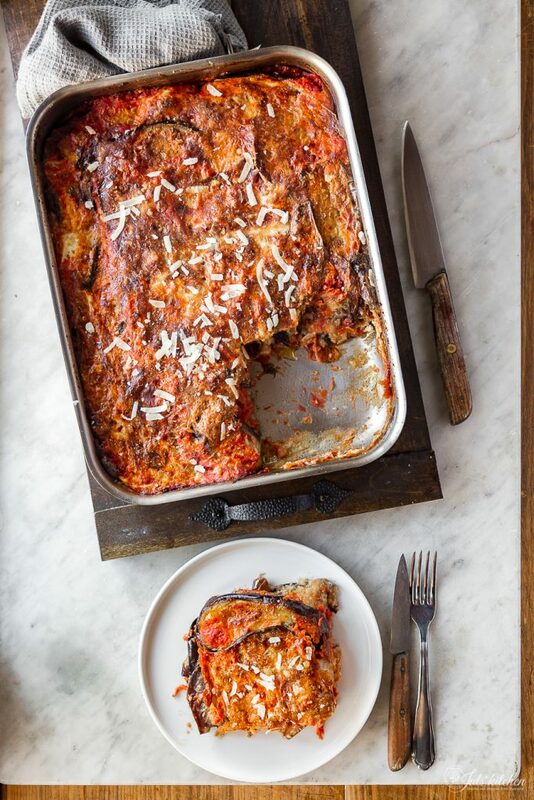 If out of the blue you ask me what I would like to eat in any moment of the aubergine season, and especially in the last days of summer when the daylight hours are getting shorter and you start to feel a nice chilly, my answer would always be an aubergine parmigiana. No, I lied. The answer would be the same even during the heath of mid-August or in the rigours of winter, without offending the seasonality of vegetables. 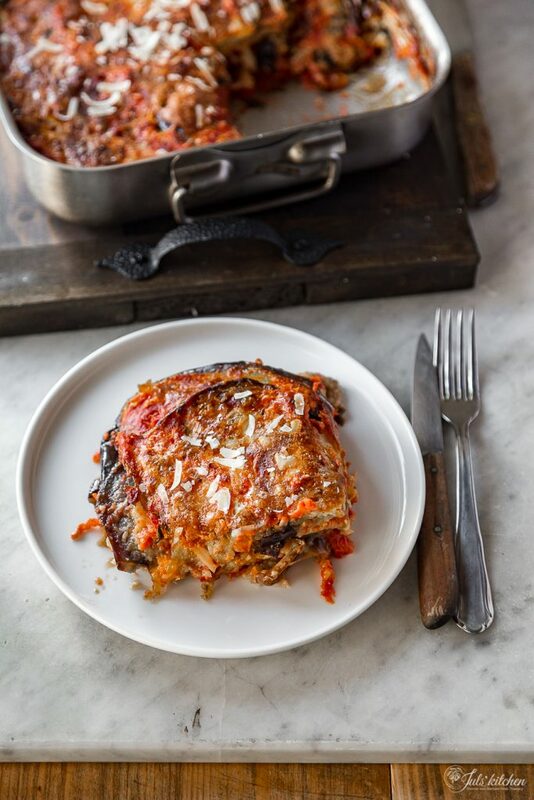 If you had not yet understood, the aubergine parmigiana, or as we call it the melanzane alla parmigiana, is my favorite dish, as Lost in Translation is my favorite movie and Bruce Springsteen my favorite singer: they hold a special place in my heart. I am pretty sure I had melanzane alla parmigiana as an afternoon snack more than once when I was a child, stealing the leftover lunch from the fridge, eating them guiltily cold, leaning against the kitchen counter. 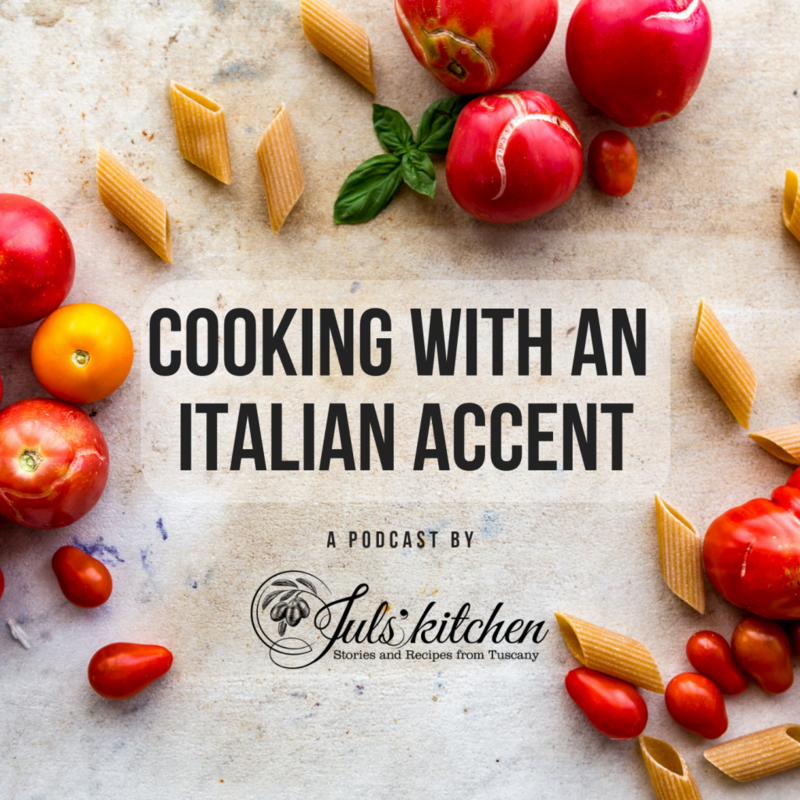 I am not able to savour it with small delighted bites, I always have big mouthfuls, I get embarrassingly greedy when I’m dealing with aubergine parmigiana, or simply with the slices of fried eggplant. If it is true that fried is good also a slipper – as we say in Tuscany -, the fried aubergines reach inconceivable levels. I’m a generous person, I love sharing food with other people, and when I choose something from a tray I tend to take the smaller piece or the less impressive, it is a form of innate modesty. I always do that, but for melanzane alla parmigiana. 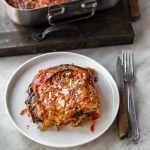 When aubergine parmigiana is served at the table I quickly choose the largest serving, the one oozing mozzarella and parmesan, the one with the golden crisp crust. I wolf it down even if it is scorching hot, even if I consciously know that it would be better when it’s warm, when the flavors mature and the biting aubergines and Parmesan are more pronounced. But I can not resist. Luckily there’s always a left serving, and then with the leftovers I get my glorious moment. Now just read my version, then at my signal unleash hell and tell me which is your version for melanzane alla parmigiana, or at least which would be your last meal. Wash the aubergine and cut them into 5 mm thick slices. Arrange the aubergine slices in a colander with a good sprinkle of coarse salt in between the layers, put a plate on top of the aubergines then place a weight over the plate. Leave the aubergines on the sink for about 30 minutes, they will be less bitter and biting. After this time, rinse all your slices under running water and arrange them on a towel. Pat them dry. Scoop some flour into a bowl and coat the aubergine slices, shaking off the excess flour from each slice. Meanwhile heat the frying oil in a large pan: the best ones are those shaped like a wok: you will use less frying oil. Check if the oil is hot enough sacrificing a slice of aubergine: dip a corner in the oil and when it is surrounded by many small small bubbles it means that the oil is hot enough. Deep fry the aubergines in batches. Let them brown on both sides, it takes about 5 minutes. When the aubergines are golden and crisp, place them in a dish with some layer of kitchen paper, so that the excess oil is absorbed. Season lightly the aubergines with salt (lightly! they have already been under salt for 30 minutes! believe me when I say it's better to taste them to see how much salt they need, it is not much of a sacrifice). Deep fry all the aubergines. Make the tomato sauce. Heat a few tablespoons of extra virgin olive oil in a pan with a clove of garlic. When the garlic turns golden pour the tomato purée, add a cup of water and some fresh basil leaves. Season with a pinch of salt. Cook the tomato purée for about ten minutes, until it has lost the taste of raw tomatoes and has become a savory and thick sauce. Finally time has come to make the melanzane alla parmigiana. Choose your favourite baking dish (about 30 x 20 cm) and spread a few tablespoons of tomato sauce on the bottom. Arrange a layer of fried aubergines, pour over a part of the beaten eggs, sprinkle with some mozzarella and a generous layer of grated Parmigiano. Spread the tomato sauce on top and keep making layers, until you run out of ingredients. If you have not eaten too many fried aubergine slices - you have my sympathy - you should be able to make four layers. Top with tomato sauce, a few pieces of mozzarella and a lot of Parmigiano. Bake in the preheated oven to 180°C for about 35 minutes, until golden brown on the top. Serve the parmigiana warm or, even better, let it cool down completely and warm it again in the evening or the next day, it will be even more tasty. Eleonora’s melanzane alla parmigiana, it’s really fun the introduction, incredible ow our Parmigiana became a Chicken Parm abroad. Jamie’s melanzane alla parmigiana, I am so happy to see they’re very similar to our parmigiana, good job Jamie, keep spreading the Italian food! 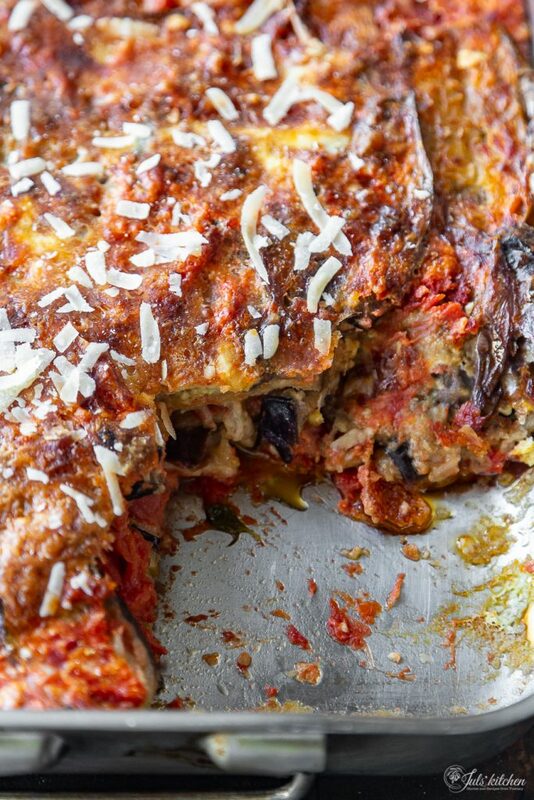 La parmigiana di melanzane di Antonio Carluccio, baked aubergine with cheese and tomato. A splendid dish! Eggplants are so versatile and when cooked in this way they are irresistible. I need to have a look at that book, I usually love every book from the River Cottage series! Dear Juls, you have my heart! I have no cravings for chocolate or doughnuts, but I have this constant “pangs of hunger” for eggplants. I had some time with my friends tonight, and we were talking about all things food. I told them what I made for dinner last night: rainbow salad with roasted eggplants. Then they asked me what would be for dinner tonight, and I told them about panini sandwich with grilled eggplants. And tomorrow there will be some meal with eggplants too. They laughed and said I must really love eggplants… 🙂 Indeed! I completely side with you. If given the choice between a doughtnut or savory dish like this, I’d always pick the latter. Always. I look forward to making this dish in the future! savoury dishes rule! let me know when you’ll make it! this is the best moment to enjoy melanzane alla parmigiana, that’s the reason! thank you for your message, I as so happy when someone loves melanzane alla parmigiana, it’s absolutely my favourite dish! enjoy it and a big hello to Barcellona, a city I love! I have just made melanzane alla parmigiana. I have made many variations previously but never with eggs. The egg addition is a plus for me. It rises up the side of the dish and cradles the eggplant perfectly.I am tempted to dive,but i will what till tomorrow. If the dish tastes as good as it looks then I’me for a rare treat. Oh I am so happy! so did you like the melanzane alla permigiana? I absolutely love epplant parmigian too. Even as a kid it was the thing I ordered in every Italian restaurant. And eggplant in general. I can’t get by without eggplants in my refrigerator just in case I have a craving! that’s a clever solution! I am amazed… this is a universal favourite dish!! love it! I did it!! and… We loved it ! Thank you sooo much! We were some times disapointed in the restaurants, but your recipe is a Winner! I’m new to cooking, and your explanations were perfect! I prepared it on last Sunday (it took me 2.5 hours ;p). I had fried 1kg of eggplants… for 2 ! So I prepared your dish with 2/3 of the eggplants and left the 1/3 aside.. By Wednesday, my Husband asked me to prepare your same dish with the rest of the melanzane! Hihihi ! So we ate melanzane alla parmigiana every single day of last week ! Thanks to You ! 😀 I’ll definitely do this again! Oh, Sandra! I am so so happy! these are the best comments and feedbacks you would wish on a blog! 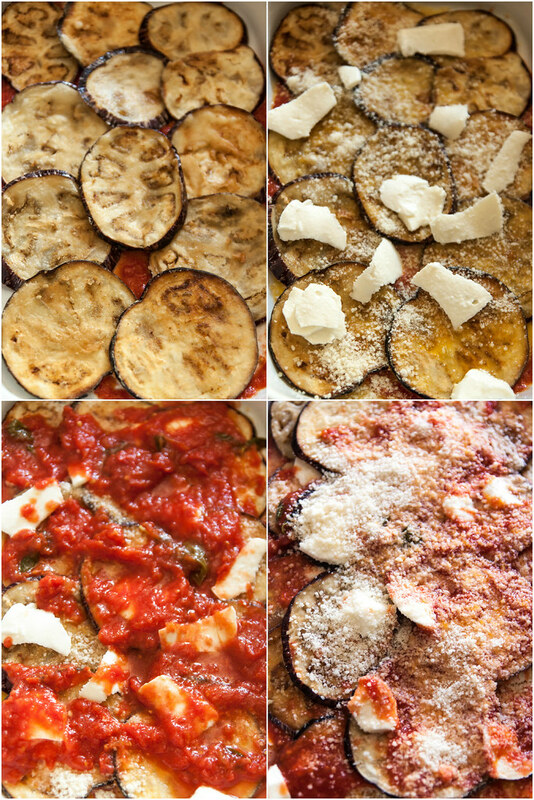 A whole week devoted to melanzane alla parmigiana? sounds like heaven to me!! My wife and I made this for my folks when they came to dinner. My father is a fully paid up Carnivore. He was less than happy when we served him up your melanzane alla parmigiana. he was soon convinced and left demanding the recipe! Thanks very much! Which River Cottage series book would be a good one to start with? Hello Clarisa, I love Cakes, it’s really nice! I made it multiple times already, so now I want to thank you for the recipe. Instead of using the egg separately, you should try dipping the aubergine slices in the egg after dipping them in the flour and then fry them. I find it even more heavenly when I do that! I’m from the Netherlands and keep coming back to this site for your lovely recipes, so thanks a lot! This was the first time I’ve ever made a parmigiana – something I’ve always wanted to try. After much searching online, I chose your recipe and the results were fantastic! Thank you so much – it was a hit and my guests kept asking for more…. now to share your recipe with them. Thanks for a wonderful article and delicious dish. Hello. I’m a Lebanese retired surgeon getting from the internet tasty recipes. I share with you the love for the Melanzane. By the way old people in my country say that you have the right to divorce your wife if she asks you what to cook when the eggplant season has come. (of course this a joke but it shows the variety of dishes you can make with eggplant). In my country I used the crushed tomatoes in boxes or in cans, all of them are sour. Eve in the States I experienced almost the same problem. Can I add sugar to the tomato sauce to make it less sour? You don’t advise the garlic bread to eat with this magnificent recipe. Hello Paul, thank you so much for your comment. I truly enjoyed tour saying, and I can see why it has a base of truth! If you want to make a sweeter tomato sauce, instead of sugar add the tiniest pinch of baking soda, it reacts chemically and you get the sweetest tomato sauce. love the dishes easy to make. WITH THESE RECIPES YOU DONT STAND IN FRONT OF THE STOVE FOR HOURS LOVE THIS. Making this tonight! Whoop woop! you know I totally agree! melanzane alla parmigiana and fried zucchini flowers are among my favourite things on Earth! 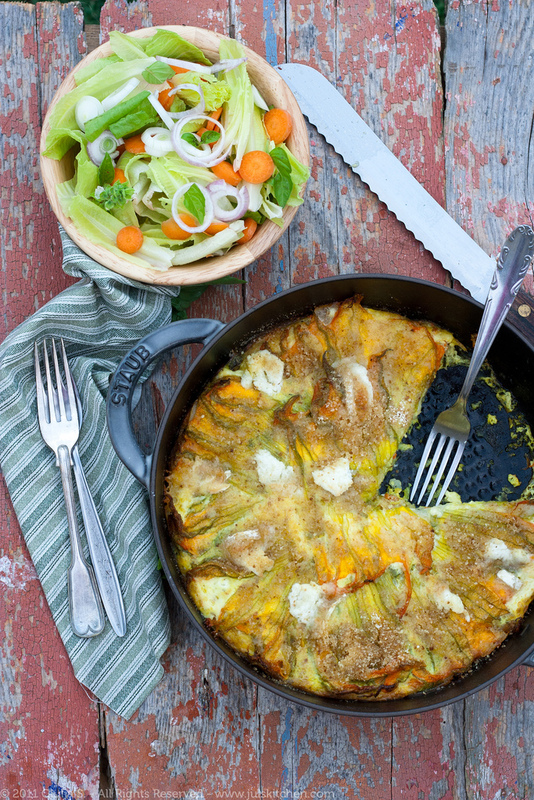 You find also a recipe to make zucchini here on the blog! 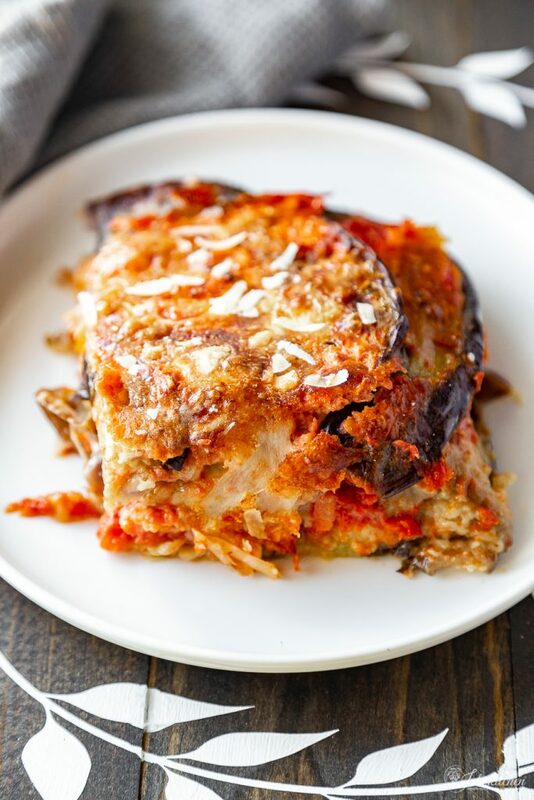 Let me know about the eggplant parmigiana! Yummmm! I just realised I forgot the eggs, and I only used 3 eggplants and a 400g tin of tomato purée (Family of 4) but it turned out amazing! Definitely a keeper! this makes me so happy! yay! I have tried previously several recipes of Melanzane alla Parmigiana from the internet. I used bread crumb instead of flour, browned the eggplant in the oven to avoid frying in oil, rubbed the baking dish with a clove of garlic, no mozzarella. Yesterday I followed your recipe except for the eggs. It was not only good, it was heavenly good ! Dear Paul, this makes me incredibly happy! I can’t wait to make this again, and again, and again! Happy Easter to you Giulia. Next to try will be your Panna Cotta recipe. I’ll let you know. I love the recipes they are a bit long I try to break it down, to make it easier for me. Please apologise to grandma but I skipped the beaten egg (laziness) and replaced mozza with edam (budget constraints) and added harissa sauce to The tomatoes (whimsy). It was… amazing. Like, astoundingly good. this is brilliant! I approve every change, especially the adding of harissa… how delicious! !